It’s not that I will NEVER repeat a trail, it’s just that with so many mountains and so many trails and options in the rockies, does one really ever need to? There is one* exception: Bears Hump in Waterton Lakes National Park. Our hiking book lists Bear’s Hump as a 2-3 hour family friendly climb. This past weekend we timed it at right around 20 minutes for the full ascent. Most “real” hikers would roll their eyes at this even being considered an epic Alberta hike, but I want to challenge that. Your experience on this trail really depends on your ability, speed, objective and of course whether or not you have toddlers in tow. We had no toddlers, and no dogs, and the objective was to get our blood pumping and sweat dripping quickly before we got in the car to drive home. We only had an hour or so in your schedule. Literally anyone can do it and be challenged. Young, old, athletic or not, you can do this hike. However, it poses a real challenge even for fit folks too. It is steep enough and easy enough to go fast that you can get a good sweat on. For a relatively short hike, it has one of the most scenic rewards of anything else in our province in my opinion. The view of the still snowy mountain peaks,and the long view down the valley of the Waterton-Glacier International Peace Park is epic. Few hikes of this length and difficulty offer such a great reward. It’s safe. With the number of view-seekers this trail sees in a day, bear spray really isn’t necessary and you don’t need any kind of performance gear or equipment. 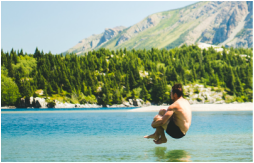 You can do this and still squeeze in a few other activities in a day trip to Waterton. * I lied, there is another one: Grassi Lakes in Canmore for many of the same reasons as this. I can do it alone, it offers a great treat at the end and is still challenging enough for a quick ascent or trail run even for fitter folks, but offers access for literally any skill level.